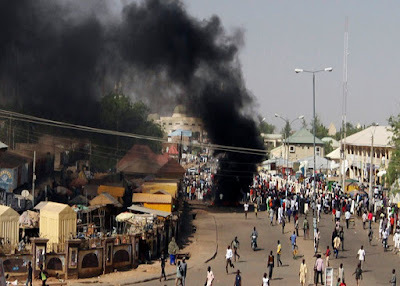 Two unidentified suicide bombers have lost their lives in a failed bid to infiltrate Mina garage in Maiduguri, Borno state. Army Spokesman, Brig-Gen. Sani Usman, in a statement released on Sunday said the incident occurred around 8pm on Saturday when the bombers detonated one of their suicide vests upon sighting troops of 195 Battalion on patrol. “The patrol team quickly moved to the scene and discovered it was only the female suicide bomber’s vest that was detonated, killing herself and the male suicide bomber,” he added. Usman further stated that the incident, left no fewer than five members of the Civilian Joint Task Force, CJTF, injured. “Unfortunately, five members of Civilian Joint Task Force (CJTF) on duty at the market were injured in the explosion. “Subsequently, the area was cordoned off and the Explosive Ordinance Device Team were drafted to defuse the other unexploded vest, while Borno State Emergency Management Agency and the Red-cross evacuated the mutilated body parts of the suicide bombers.